Still reeling from the effects of The Wrong Goodbye, Sam Thornton is tasked by his handler Lilith to take out the mysterious Brethren, a group made up of former Collectors who have severed their ties with Hell. I received an ARC of The Big Reap from Angry Robot in exchange for a fair review. Thanks to our literary robot overlords! The opening scene of The Big Reap will have a spot among my favorite openers ever. Not only does Chris bring you up to speed if this happens to be your first Thornton novel (and seriously, who starts on the third book of any series - go read those first two! ), he also takes us back and tells the story of Sam’s first collection. That particular story is told over the course of the novel as Chris presents it side-by-side with Thornton’s crusade against the forces of the Brethren. Both stories are equally compelling so when he switches back and forth, you’re not exactly dying to get back to the other. Like the first two novels, Holm continues with his excellently choreographed action scenes. There’s some high octane stuff here involving Thornton having to use his environment to gain advantages. It’s a wonder how Holm can make the character so damn confident when he always seems to just barely come out on top. Sam never seems to have a solid game plan and often relies on thinking in the moment – something that keeps the action moving swiftly with consistently unpredictable results. All of these factors leave us with a story that is a real blast to read. Sam is quickly becoming one of my favorite characters. While he carries with him the attitude of a blockbuster movie action star, he’s also a tragic character at heart. As his journey progresses, he realizes just how hopeless his future really is. It would be easy for Holm to give us a character with big bravado who constantly comes out on top but instead gives us a character that learns, develops and grows with each story. He's like John McClane from the first Die Hard movie – not the John McClane that developed over time and became an indestructible superman. In my opinion, this is Holm's finest work yet. 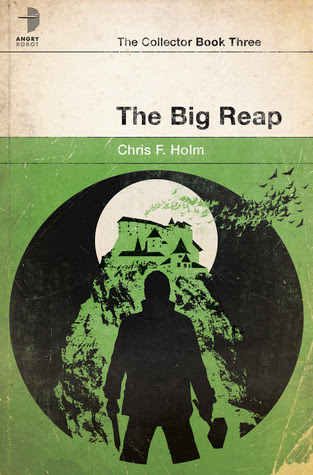 Taking nothing away from the first two books in the series, The Big Reap has raised the bar for any potential sequels.